Because rhombus contains vertical and horizontal directions simultaneously, we can say that is the symbol of the unification of matter and spirit. Unites heaven and earth, the direction of elevation, aspiration to divinity and horizontally material oriented. Because peaks represent the extremities of the cross, may be a close and direct connection between the two symbols. Rhombus is a geometric representation of a universal Corresponding Law filed by Hermes Trismegistus by "As above, so below; as below, so above". Represents the unification of low aspects with the upper, so unify sexuality plane with higher mental plane, the functions of assimilation with the elimination, left to right and masculine with feminine. Rhombus synchronizes brain hemispheres activity. Although it has the same number of congruent sides as square, diamond is a dynamic figure, generating energy and motion. Rhombus unites and harmonizes the functions of breathing, digestion and excretion. Traditional Oriental science of Ayurveda says that the disease is an imbalance of yin and yang (male-female), the healing process is actually the process of re-balancing, so the rhombus is geometric figure of healing. The line is infinity symbol even if it is situated between two points. Mathematically, even limited line between two points is actually infinite because it contains an infinite number of points, no matter how close are the heads. The proof of this statement is made if the line split in two, and the remaining portions shall divide them again and again, each time finding a point in the middle, we can repeat indefinitely the process. The most simple geometric element after point, line has to do with the essence of the manifestation of shapes and forms, without it is impossible to define a form. It is actually the contour of each shape, delimitation and separation between form and environment. It primordial separation and differentiation, give rise of duality dividing the whole into two. It is said that in the beginning God has drawn the line and divided the light from the darkness. Generate of Creation was made by guiding lines of force. Another aspect, apparently opposite of the line is the connection he makes between points and between forms, Creating bridges and unifies points of view, is the symbol of communion, communications, human relations and the love. Our entire world is based on complex game of lines, richly interconnected lines creates a complex network, a mysterious Cosmic warp in which we are interconnected with all that exists. If we ignore these lines and their secret connection or even "would cut" it consciously or unconsciously, greatly deepen us in ego, we separate the other, the nature and the Universe. Another interesting symbolism is the indefinitely content of limited line by two heads. In one sense the human being is the same, are limited to a physical body, with solid outline, we are still unlimited if exploring inside. However we analyze and we deepen us, however examine our inner being we find new aspects, new points of view, becoming more comprehensive and profound. Limited outside but also infinitely inside, in-depth. Vertical line represents the symbol of elevation, ascension to the Divine, the horizontal line orientation mean to world and society direction. It is a good remedy for people who feel disconnected from others, nature and the universe. Provides direction, so it is beneficial for those who do not find their way. Point is the center of everything, the whole creation revolves around him. Since it is static, universal complex movement is performed and centers around his. It is symmetry center, the unification of opposites, the male-female polarity, up-down, light-darkness, good-evil, life-death. Point is the source from which everything arises and in which everything turns, is the explosion and implosion of the universe, it is the symbol of supreme consciousness, non-formal and bond strength and cohesion of all that is. Originally The Unique projected and split herself in all its divisions, thus creating the world of names and forms, world which unites back in same Unique Divine. Mandalas created by Emrys, have without exception a single point of creation that is the point of harmony, the center of gravity of the work. If we focus on this central point, generator, without let being absorbed by the beauty of the surrounding enter into communion with the One Divine. Is a very simple and effective way by which we learn what communion with God mean. Point is mathematically rather an element without substance and form because does not scale, is brick underlying of space but still is not found. It is intimately connected with invisibility and ubiquity of Divine, is in everything and still is nowhere. It is a very good remedy for decentered human beings, defocused, with a tendency of excessive externalizing and scattered. Number one is the one God number, the entire absolutely undivided and undifferentiated. Number one it is related to the geometric point is the center of everything, all the numbers have gone from one, is the unification of all dualities and opposites, the male-female polarity, up-down, light-darkness, good-evil, life-death . In the tantric spiritual tradition symbolizes the lingam full of force and potency. Number one contains all and start all from it, is totality, beginning and origin, the initial impulse. One also represents individuality, uniqueness. On a personal level, beings are characterized by one are unifying, peace loving, we can say that is simultaneously leader typology, the innovator, the opener roads. Well there is also a negative aspect, beings characterized by number one can be individualistic, overly excessively authoritative and selfish, ego-centered, in this sense number one can also represent the primary egotistic impulse. Originally The One split and projected herself in all its divisions, thus created the world of names and forms, the world which unites back in same Unique Divine. Through one number can enter in communion with the One Divine. It is a very good remedy for non-unified human beings, dissociated inside, out of focus, with a tendency to excessive externalize, changeable and scattered. Correlates with the point and the circle of sacred geometry and the white color. The number four symbolizes matter, stability, robustness, represent the four directions in the physical world. On number four builds resistance structure is the fundamental basis on which supports every aspect and idea. Also represents pragmatism, realism, logical thinking and organization. From here arise also negative aspects to the physical limitation that keep us earthbound and materiality. It can be said that the highest aspiration four oppose through weight and inertia that gives. Four is related to the seasons and the phases of the moon. It looks like the figure four oppose spirituality. Due to the positive aspects as organization, determination and perseverance number four still help us very much in spiritual practices in transformation and evolution. It is also a number that can help in the initiation of couple relationships, business, due to durability that gives. By assimilating four number vibration or start date and time correlation of four can plan and launch large projects that require durability. Correlates with the square and diamond from sacred geometry and brown and dark green colors. Eight represent task forces, the specific vibration of managers, leaders. It is a powerful figure that gives control, power and wealth, the number of success. The number eight is leads the way providing optimal and effective action. Beings who have assimilated its vibration have great talent for management in all areas, especially in business and also in other fields. They have a very strong personality and a great sense of initiative. On the other side, beings which are characterized by eight can show stubborn, excessive pride, egocentrism, impulsivity and authority carried to dictatorialism. As his double of four number eight gives stability and perseverance. Octagon correlate from sacred geometry and orange color. Two is the number of primordial duality, the one born two of first as creating the first dual pair, complementary. Two is all dual pairs of manifestation but also a unique way to return to the reunification of opposites. 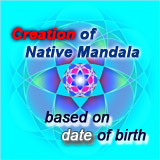 Number two is related to creation because without this number it is not possible to differentiate the unique in various aspects. This number represents two primary forces, universal, original trends, ie attraction and repulsion of dualities, north-south, plus-minus, male-female. In all creation we see this infinitely rich game of polarities, directions, tendencies, this eternal love game's. Every part has a counterpart, this universal law of polarities available can help us in many aspects of life if we understand well and correctly apply. Number two is couple number of forces, if we understand the deep meanings, we can strike a balance and a great control over the manifestation. Symmetry Emrys's work is based and emphasize the two number. Number two has to do with the number of gold that is revealed to us the mystery of division and primary ratio. On the other hand two number may also represent the evil forces, the primary separation, the break connection with divinity and ego. Therefore, it is important the vision what we have, we see differences and separation or unity and complementarity. Second number is a number of healing it can bring balance between polarities, between yin and yang, balance body functions can. With one number two great therapeutic valences gets. Correlate with the line of sacred geometry and the purple color. At the beginning of creation The Unique God divided Himself into two parts in a proportion very well defined in such a way the One Divine to rediscover and to reflect Himself on each side. Only in this way can be perfectly symmetrical creation and harmony in itself. This principle of division was repeated indefinitely, on several levels in the generation of Creation. Mathematically we can find a number that corresponds to the principle of primary division equalizing reports obtained from the first division. More specifically if you divide a segment into two parts, the first part a denote with a and on the other with b must have 1/a=a/b, because b=1-a, get on the formula 1/a=a/1-a, otherwise writing 1/a-1=a, from this formula we want to find the ratio x=1/a, meaning x-1=1/x brings us to the equation x*x-x-1=0. The solution is 1,618… number that represents the golden number which can be found in the golden triangle of Pythagoras, the pentagon, the golden ellipse or spiral gold in the Fibonacci sequence which represents the natural growth. This special ratio is found almost everywhere in nature, in the human body and art. This is the principle that underlies the generation of fractals. Explain the design principle of everything in part and part in everything. It is primordial and universal law of harmony. It helps us to put in balance and harmony organs and body functions. Therefore each organ will work in harmony with the whole body. Violet is the color with the highest vibration from colors in the spectrum. Thus, is the most spiritual color after white. It is the color of interiorization, of our Divine essence revelation. It is the color of spirit elevation, of clairvoyant. Violet is color of spiritual depths revelation and communication with spirits from other planes. It is a magical color, subtle and full of deep spiritual meanings. Violet is the color of the initiated, magicians and occultism. Violet is the color deep, depth. Give us a very pleasant feeling, is very sweet and attractive. It is a complex color paradoxically combining the energy and warmth of red with cold blue. Color is hard to find in nature, that seems to be reserved for special conditions, is associated with extravagant and unusual. Lilac purple, being specific to feminine suggest refinement, grace and elegance, is special and unique. It is a good remedy for atheist people, demoralized, no longer believe in anything and blame the lack of meaning and purpose in life. It's great for bringing hope, out from routine to opening new spiritual horizons. Violet acting directly on brain functions, facilitates penetration of mental and activates the right hemisphere and other unused areas of the brain. Yellow is the color of the will, the force of action and achievement. Is a solar color specific masculine. Is the color of wisdom, self-confidence and trust in the Divine. Because it is associated with will, dirty yellow is the color of individuality, the egotistic will broken universe and divinity connection, is ego color. Will can be pointed in a benefic direction, according to divine but also in the reverse direction, the pure yellow harmonizes being at will level, reducing feelings of enervation, violence and anger. Yellow is a radiant color that comes strongly towards the viewer, comes in evidence easily, creating strong contrasts with dark colors especially black. It is a suitable color for advertising that comes with power, aggressively towards the viewer's, attention poaching. Has a good influence to the solar plexus and digestive fire favors improving digestion and assimilation of food. Simultaneously increases concentration and speed reaction. Color also suggests wisdom and help us restore spiritual connection with nature and with others. Yellow cleaner is very useful for violent people, irritable, impulsive, which angry from any. White is the most spiritual color symbolizes uncreated Divine Light. Because contains in itself all the colors has related to totality and Infinity. White elevates being, is the color of purity, openness to spirituality and Divinity. Fill all of shine and makes possible the manifestation of colors and shapes. It is the color that helps us see ourselves as we are, we accept and transcend the ego. White is highly used in probing the subconscious to bring to light the hidden and repressed parts of us. White mixed with one of the other colors light up, so has the ability to purify and to elevate colors. White is related to an important characteristic, namely color brightness. Colors can be divided by the proportion of white light and dark colors. Near black, white creates the strongest possible contrast, is a color located in the extreme. It is a good remedy for closed people who have a habit to hide and which are almost always in shadow. Purify the body, enhances and amplifies the effects of fasting, both body and spiritual level. Very useful to use in analyzing of self and self-knowledge.